This chromolithograph is taken from plate 36 of William Simpson's 'India: Ancient and Modern'. 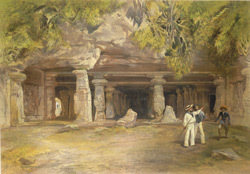 The island in Mumbai (Bombay) Harbour which houses this cave-temple was named Elephanta by 16th-century Portuguese travellers who discovered a stone elephant there. Locally known as Grahapuri, the temple is dedicated to the Hindu god Shiva. The main shrine has large carvings on its walls taken from the mythology of Shiva. It has two main focuses of worship: the lingam, which is in a separate sanctuary flanked by door guardians; and the huge and much-celebrated bust of Shiva with three heads, representing the Creator, the Preserver and the Destroyer. Since a large inscription has been lost, the date that these temples were established is difficult to ascertain, though they were most likely excavated in the sixth century.